Read my review of To All The Boys I've Loved Before! YES! YES! YES!! I cannot wait to read this one too! Ain't that cover perfect!?! 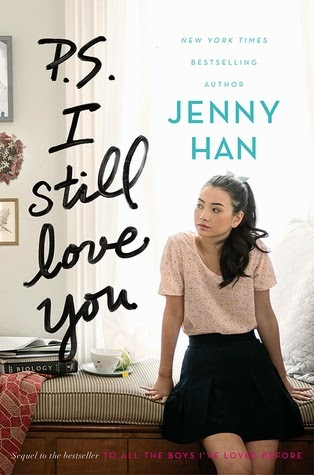 Please let Lara Jean and Peter end up together! I'm begging! Right?! It's all we're asking for! I haven't read the first one but have heard nothing but RAVES!! That definitely merits checking it out!! Cute cover! I haven't read the first book yet. I hope you enjoy reading this one! I don't, but I loved the first book, so I'm excited to see the direction of this one! That's okay! And OMG on the right hand, right?! Weird indeed! The first one was a dnf for me, but I love these covers and titles! I think I saw this one mentioned last week. It sounds like an entertaining read. Hope you enjoy it when you get a chance to read it. Have a fab week, Alyssa. I hope it's good! Thanks, Marilyn! Me too! And OMG right?! But it's slightly better than early June - the original publication time! I've been seeing this one around, it's not my type of read though. But hope you enjoy it when you get ahold of it! Thanks for visiting my post earlier. I know what you mean! Thank YOU, Lisa! I've heard mixed reviews about the first book in this series, but it sounds really good to me. I hope you enjoy this one! Thanks for stopping by my blog. Have a great week, Alyssa!